Food stuck between your teeth? No big deal, or is it? Just a meal for later maybe? Click HERE if you want some ideas on how to get the food OUT. Read below for some info on how to permanently fix the problem. This week (and every week really) I see a lot of people that get food stuck between their teeth. For a lot of people it is a great reminder to floss regularly (at least that is what they tell me). Most don't think it is a big deal and don't want to fix the cause of the problem. They are ok to live with it. For a long time I had a spot where food was getting stuck between my teeth every time I ate meat. I LOVE meat!! It was very common for the area to become a little bit achy and sensitive to pressure. It would bleed every time I flossed (not a good thing). I let it annoy me for almost a year. I remember one time my wife and I had been to dinner and were just getting into a great movie. The pain from the meat stuck between my teeth was getting very intense. I didn't have any dental floss on me, the only thing I could see to use was the straw from the drink I had purchased at the movie theater. I started digging between my teeth like crazy with that straw, but I just couldn't get that meat out. Finally I left the movie and went to the bathroom to use the mirror. I was still not getting that chunk out of there. My wife texted me, "where are you, what is going on?". I texted back the details of my predicament. Luckily she had some floss in her purse (the things found in purses still amaze me), she came to the bathroom and, with the floss, I was able to get that chunk of meat out. After that I asked a friend of mine to fix the problem. After a quick filling I feel great. I wish I would have fixed the problem long before I had to suffer so needlessly. So now comes the question, "Is it a big deal to have a spot where food gets stuck between your teeth?". You all know I am going to say yes. YES! Every time you get food stuck between your teeth it can cause multiple dental problems. Bacteria that live in our mouths can take that food and use it as fuel to multiply. As they multiply they can invade the gums and tissue around the teeth. Eventually they may even make it to the bone under the gums. More often as they get near the bone, the bone pulls away (periodontal disease bone loss). The bacteria may also invade the tooth (decay or cavity). More often BOTH happen. Even if you clean out that food with floss or a toothpick there are still small remnants of food present. Bacteria are just little guys, they don't need much fuel to get excited. So why do we get food stuck between our teeth? 1. A cracked tooth or cavity between the teeth that caused a small space to form between the teeth. 2. A filling or crown that doesn't have contact with the tooth adjacent to it. A filling or crown with an overhanging portion that sticks out and grabs food. -If you get a crown or a filling and you start to trap food you need to go back to the dentist and tell him/her something is wrong. Sometimes the dentist didn't get the filling tight enough to the adjacent tooth, sometimes there is some excess material that needs to be trimmed properly, or sometimes the cavity is too big for a filling and really needs a crown to properly close the space. These things happen, even to the best dentist. 3. 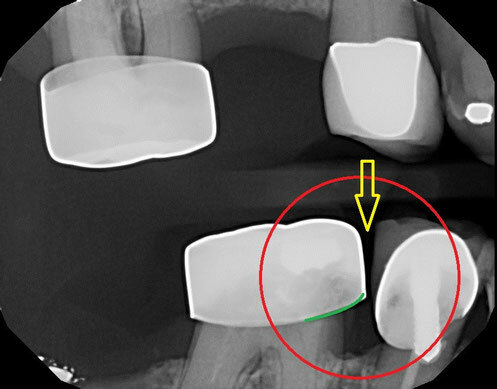 Receeded gums that caused spaces to be opened up between the root surfaces. -This is a tough one, on this one a good tool is the proxy brush. It's a little Christmas tree looking brush that can get in between the teeth and clean better than floss or a toothpick. 4. Teeth that have moved for one reason or another. -Most common reason for teeth moving is periodontal disease that have allowed the teeth to be loose. On the upper right of this x-ray you can see there are two fillings that just don't quite touch. That little gap between the fillings is the perfect space for food to get "jammed" in between the fillings. The red arrow shows the gap where the fillings/teeth do not touch. 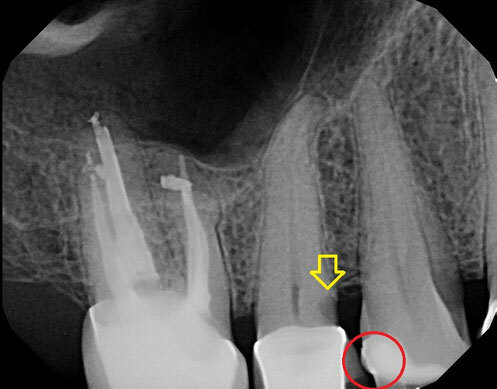 The yellow arrows show where cavities are creeping in under the fillings. We ended up replacing both of these fillings with proper contour to prevent food from lodging in between the teeth. The ultimate test is to floss the area and make sure the floss "snaps" through. If it passes through without snapping there is a potential problem. This one at this point is the fault of the dentist that placed those fillings (Not me here, these two fillings belong to another dentist). This gentleman came in for a routine cleaning and exam. When I told him he had a cavity on the root surface of his tooth, under his crown, he was very surprised. Honestly, he was very upset. He said, "let me ask you something. How can I get a cavity on that tooth when it already has a crown on it?" That's a great question. Crowns aren't cheap (at least the good ones aren't) and nobody wants to pay to crown a tooth twice. Well here's why. 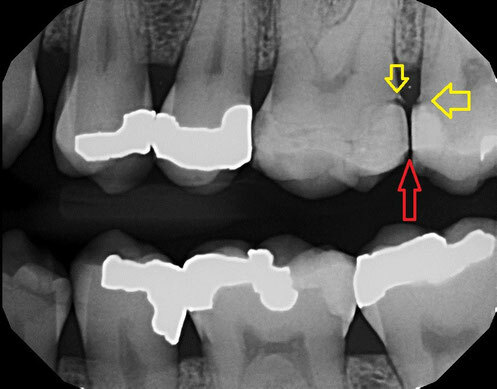 If you look at the lower right of the x-ray you can see the yellow arrow pointing to the cavity. The red circle is the reason. The filling on the tooth in front of the crown is broken and chipped. That broken spot is causing food to get stuck between the teeth, that food caused the tooth to decay under the crown. We removed the old crown and the decay was more extensive than even appeared on the x-ray. Had we waited any longer the patient may have needed a root canal in addition to a new crown. This patient is a nice older lady. She has a couple of problems in this area. The yellow arrow shows the gap between the two crowns. I looked in there and found 2.5 meals stowed away for future consumption. Her gums were bleeding and swollen. She claimed she had no problems with the area. The second problem is highlighted by the green line. It shows a poorly fitting crown on that molar. The edge of the crown is grabbing food and packing it in between the teeth. This crown was placed years ago by a dentist that was trying to give this patient a temporary fix for a broken tooth. It is a stainless steel crown similar to those used on little kids. They are only meant to be placed for a few months on adults. This one has been here for many many years. Now she has a very deep cavity on the molar AND on the tooth in front of the molar. Now she needs two new crowns. Look at the crown above the red circle. It is a beautiful crown that was done properly. It is going strong and should continue to do great for a long time. Well, this is getting longer than I anticipated. Here is the summary, if you are getting food stuck between your teeth you need to tell your dentist. He or She can help you fix the problem or prevent any future problems. Just a note, every case posted above is a case I saw in the last 2 days, and I could have posted more. This stuff happens all the time to a lot of normal people. 1. Keep that area flossed. Don't let food sit in there, you will need to floss right after each meal. Be careful with toothpicks. They can do more harm than good. 2. Brush some Listerine into the area each night before going to bed. Dip your tooth brush into some listerine and brush your gums where you get the food stuck. Rinsing alone won't be enough. It just doesn't get in there deep enough. This was very helpful! Thank you for marking up the xray s so readers could visually understand. You're welcome Alex and Joyce. Glad to help. Dr. Strong, I have a crowned tooth that has a gap between the adjacent tooth, but it seems like the gap is only on the inside of the teeth (tongue side). This gap has bothered me ever since the crown was put on. I have had a filling put into the adjacent tooth to try to fix the problem and I have had the crown replaced. Because of this gap close to my tongue it plays with it constantly to try and remove food, which drives me crazy. Nothing has worked to fix the problem. I feel as though my dentist is fed up with it, so I saw another dentist and they said it looked fine. Should I seek out another dentist or go back to my dentist and try to get him to fix it again? This has been going on for 2 yrs. Heather, If food is getting trapped in there it does need to be fixed. Sometimes the adjacent tooth needs a crown too, sometimes the gap is too big to fix with a filling. I also know some dentists are better at closing spaces than others (with composite fillings) so take that in to consideration. No one wants 2 crowns (more $ for sure) if they don't absolutely need them. Thanks for posting!! Glad to know that I'm not alone and that this is a normal easy routine situation to fix. I hate going to the dentist but I guess is more the "Fear of the Unknown". You've explained perfectly the various options. If you were near, I'd ring up for an appointment....Thanks again! I just got a filling done and the contact s any resistance. the contact is weak. This is the second time this happens with the dentist working on my teeth. It is clear that creating good contact in a filling isn't / wasn't his best learning. The director got involved and created a slope on top on my tooth indicating the food will slide right off the tooth. I wondered if the director thought I was stupid to believe his slope would solve the poor contact. It did not and now I have a sharpness on top of the tooth he created...double problem. In my upper left back teeth, my dentist told me I have a space in between that last + second to last tooth. She said this is why food is getting stuck. I had pain in this gum between those two teeth and my dentist pulled some pieces of food out that were stuck and pushing into my gums. I've always taken excellent care of my teeth. It's been a few weeks since my last appointment; the pain had stopped, but it has come back again. I can feel tiny pieces of food getting stuck again and floss/mini brushes aren't helping. I've also been using my prescription mouthwash but I can't feel an improvement in pain. Right now, I just flossed and there is extremely intense pain in between these teeth. Even if I push on the teeth themselves a little, it hurts. I don't know what to do because my dentist is just telling me to keep flossing. I do everyday! I have to take some Advil for the pain but it's still throbbing. Any thoughts, doc? Hi Andrea, Sorry to hear about you situation. The only way to really fix it is to close the space. That can be done ideally with a small composite filling, or maybe one on each tooth. In the mean time make sure you are brushing the prescription mouthwash into the area, not just swishing with it. Some people like to put a bunch of mouthwash in their mouth and then put their toothbrush in there and brush into the area. Swishing often isn't enough, I tell all my patients that have gum problems they MUST brush their mouthwash into their gums. That goes for Listerine as well as Peridex. If you were my patient I would place a small (as small as possible) composite filling on one of your teeth and close the gap. Other options are a crown, or orthodontics to push the teeth together, maybe a great excuse to get braces and improve your smile. I suffer the very same as LORI, it is driving me insane, have not been back to my dentist since he filled my tooth a few weeks ago, as i thought he would think i was mad, i keep flossing but no good at all, what can i do. Thank you for taking the time to post this response. It describes my problem exactly. I will take your advice and see my dentist immediately. I wish I could go to you! You seem to know what you´re doing. But I´m too far away. Does food stuck in teeth cause toothaches? In Dubai, after fillings and root canal, the clinic wanted me to crown 3 molars. Back in the Philippines were crowns are cheaper, the dentist with 29 years experience says I don't need crowns and and at 74 years old with complete set of teeth, I am ok and just have to keep flossing to remove food that always end up between my teeth in 3 places. What can you say about my situation Dr Strong. Thank you greatly. Thank you!! I had a cavity between the teeth filled about 2 months ago and since then I have pain and lots of food that get stuck between the tooth. I went in about 3 weeks after it was filled and they did an xray and put some sensitivity paste on it and sent me away. So here I am 2 months later still with pain and flossing hunks of food out of that area several times a day. Im going back to them tommorrow and no one is going to send me away like im the crazy one!! Thank you! I had convinced myself I had periodontal disease (which would be especially upsetting as I'm pregnant) because the gums around a couple of my teeth have been extremely irritated and they've been trapping a lot of food when I floss (seems like there is more space, and I theorized periodontal pocket). Today my dentist told me it was only gingivitis caused by the food getting trapped because I didn't have enough contact between the teeth, not due to bone loss but due to a cavity in one case and a chipped filling in the other. I've still been a bit anxious and nervous about tomorrow's dental work (thinking, what if she is wrong? Especially since she hasn't taken x-rays to confirm it due to pregnancy, and so weird that two teeth so close together should both have issues). But your clear explanation and pictures give me some added peace. Dear doctor for almost 2 years l have been suffering from the sensation of food being stuck between my teeth. I have been to 4 different dentists and they say there is no visible signs of any food particles between my teeth. l have had my teeth cleaned professionally twice and it hasn't made a scrap of difference. l only have my own teeth on my bottom jaw and l feel like having these teeth removed to fix the problem. Can you please help me. Dear Doctor for almost 2 years l have been suffering from what feels like food particles being stuck between my lower teeth on my lower jaw . l have had my teeth professionally cleaned by 2 different dentists and they both claim there are no visible signs of anything between my teeth.l cannot see any food particles either but the sensation is so real, it bothers me immensely. Can you please help me. Most of my teeth are extremely close. I floss after every meal when I can, but when dining out, i usually have food that is visible. Would multiple fillings be the answer? Preventing tooth decay in the first step is the most important one because if you are able to save your teeth, you can save yourself from all the pain and payment you would have to pay to a <a href="http://caidentistry.com/services/emergency-dentistry/">dentist</a>. Food also play an important role in your stopping tooth decay process. Hello, this might seem a bit off from the topic of discussion, but I had a piece of food that was stuck between my teeth. I accidentally swallowed and it smelled horrible and putrid. Does anyone know if it’s dangerous? I don’t know what it was, if it was meat or chicken, or something else. I am afraid I could get food poisoning. Thank you. I've had this crown replaced at least 3 times and it's still a catch all, causes great pain and even more when I use floss - like a knife cutting into the gum. I have a water pick that helps a bit, but I'm constantly in pain and a small pearl-like lump is above the tooth area. Eating Romaine lettuce, which I love, is the biggest culprit, it seems. I've seen at least 3 different dentists and wonder if I should just get the tooth pulled (it's already had 2 root canals). It's close to the back left. Any ideas?